In the 1950s and 1960s, Americans were obsessed with “tiki culture,” the relaxing, tropical lifestyle that they perceived was led in Hawaii and the rest of Polynesia. It flourished from the stories brought home by World War II soldiers, Hawaii’s statehood in 1959, and the hit musical South Pacific. While tiki culture is no longer a nationwide fad, some of the kitschy bars that flourished during that era are still around, and new ones spring up occasionally to give folks a taste of a tropical paradise, whether they can actually visit that paradise or not. Bootlegger and world traveler Ernest Raymond Beaumont Gantt established the first tiki bar in 1933 in Southern California. 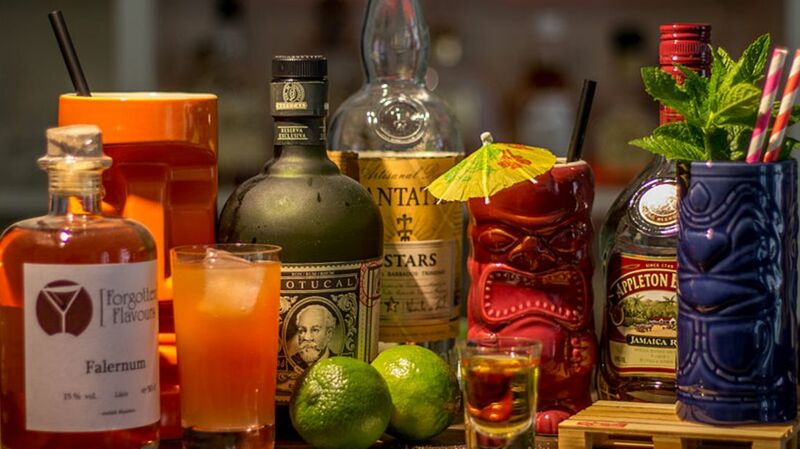 He decorated it with souvenirs of his South Pacific travels, and designed a cocktail menu around rum—in fact, he originated the Zombie and other familiar rum drinks. Rum was associated with the Caribbean islands but, more importantly, it was the cheapest liquor available. He named his place Don the Beachcomber. It was so successful that Gantt changed his name to Donn Beach. During World War II, Beach’s wife Sunny Sund (no, she never went by Sunny Beach) expanded the number of bars to 16 locations while Beach served his country. When they divorced, she kept the chain, while he opened a Don the Beachcomber in Hawaii. Since then, there have been more than 20 different Don the Beachcomber bars all over the country. Today, they exist in two Hawaiian resorts and in Huntington Beach, California. The Sip 'n Dip Lounge opened in 1962 as the bar at the (then) new O'Haire Motor Inn. Its tiki theme was quite a novelty in Montana, being so far away from any tropical beaches. Another draw was the glass wall between the lounge and the motel’s pool, which allowed bar patrons to watch swimmers underwater. In 1995, during a nationwide revival of the tiki bar, the Sip 'n Dip added mermaids: swimmers in mermaid costumes performing in the pool as bar patrons watched through the glass. Another draw is “Piano Pat” Spoonheim, who has been singing and playing piano at the Sip 'n Dip for more than half a century. The Tonga Room & Hurricane Bar was established at the Fairmont San Francisco hotel in 1945. That’s when the hotel’s 75-foot tiled swimming pool was turned into a lagoon for the new tropical-themed lounge designed by MGM set director Mel Melvin. It was a chic place for clubbing in the 1940s and '50s, with a floating bandstand and live music. The floating stage has a roof because, every 15 minutes or so, a (manufactured) tropical rainstorm falls over the lagoon—complete with thunder and lightning effects. The Tonga Room was slated to be demolished a few years ago to make room for a ballroom but, amid protests by preservationists who cited its historical significance, it got a reprieve and is still open. You don’t have to drink at a bar to become enamored with tiki culture. In fact, many folks fell in love with the aesthetic long before they were old enough to drink by visiting the Enchanted Tiki Room, which opened at Disneyland in California in 1963 (at the height of the tiki craze) and at Walt Disney World in Florida in 1971. It was the first Disneyland attraction to feature animatronic characters singing and dancing for the audience. The Grass Skirt Tiki Room in Columbus, Ohio opened in 2012. Any drink on the extensive cocktail menu can be enhanced by their signature flaming lime. Lighting at the Grass Skirt is provided by blowfish lamps, a skull chandelier, and a “lava wall,” backlit with glowing rivulets of faux lava. Hale Pele has the South Seas decor and the rum drinks you expect from a tiki bar, plus a couple of features they’ve grown famous for: their pyrotechnic cocktails and lamps made of real pufferfish. Owner Blair Reynolds was enchanted by tiki culture when visiting the Enchanted Tiki Room at Disneyland as a child. He built his bar with a moat and a volcano. When someone orders a Volcano Bowl cocktail, they set off an “eruption” with smoke, rumbling noises, and lightning effects. The moat has its own rainstorm, too, every hour on the hour. The Tiki Bar at the Postcard Inn at Holiday Isle in Islamorada, Florida, opened in 1969 as The Hapi Hula Hut. The open-air bar at the resort’s marina became the Tiki Bar in 1971. It was there that bartender Tiki John invented the Rum Runner cocktail in 1972. The story is that he created the drink on a dare when the bar had an overstock of rum and various liqueurs. The Kreepy Tiki Bar & Lounge serves tiki drinks, but also hosts a variety of live music, from metal to ska to jazz, and comedy and burlesque acts as well. Next door, you’ll find Kreepy Tiki Tattoos & Boutique, where you can peruse an art gallery and get a new tattoo. The tiki-themed tattoo parlor actually came first, in 2008, then expanded into the lounge next door in 2014. The Mai-Kai Restaurant in Fort Lauderdale has been in business for 60 years. Brothers Bob and Jack Thornton were impressed by Don the Beachcomber as children, and opened their own Polynesian-themed restaurant in Florida in 1956. It was one of the most expensive restaurants to be built in the country that year at about $400,000, but it became such a hit, the Thorntons recouped their money and even made a profit in their first year. The Mai-Kai’s cocktail menu uses the same tiki recipes today as they did in 1956. The most unique feature of the Mai-Kai is the Polynesian Islander Revue, a floor show with hula dancers, war chants, and fire twirlers. One of the early dancers was Mireille Thornton, who married Bob Thornton and now owns the restaurant—and choreographs the show. Mai-Kai is on the National Register of Historic Places.